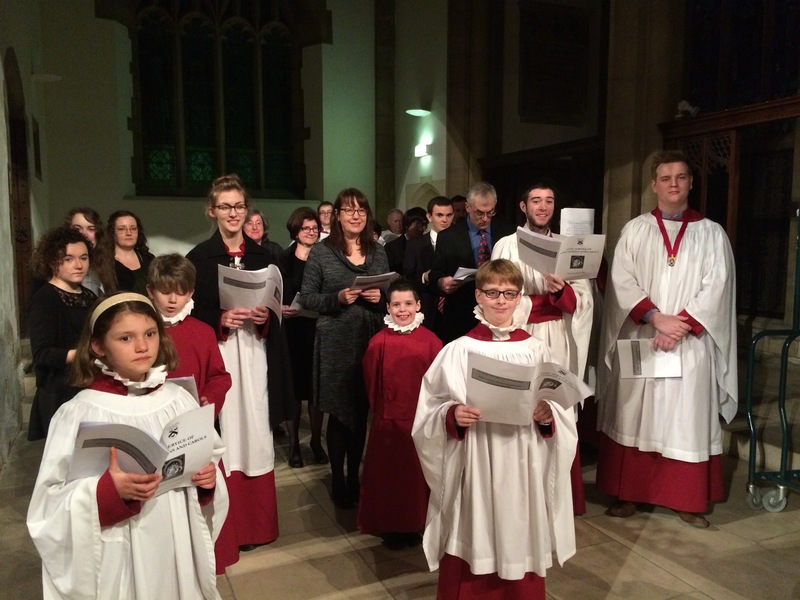 After our Christmas break, choral services start, again, with Choral Evensong for the Feast of the Epiphany sung by the Minster Singers on Sunday, 4 January 2015 at 6.00pm at the Minster. Music by Brewer, Cornelius, Daquin, and Smith will feature in the service to which all are welcome. The Minster Choirs ahead of the Civic Service of Nine Lessons and Carols. 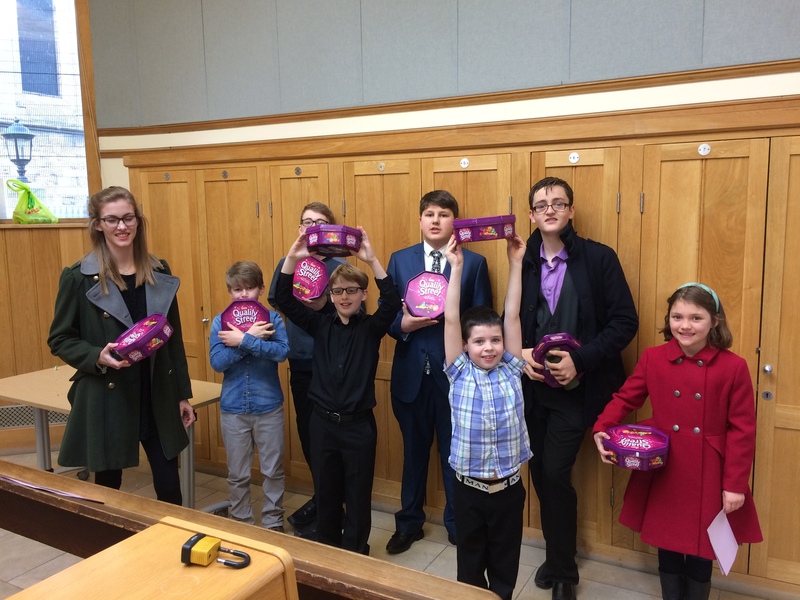 Members of the Choirs of Grimsby Minster are now enjoying a well-earned Christmas break after a very busy December featuring countless carol services as well as the regular round of choral services. 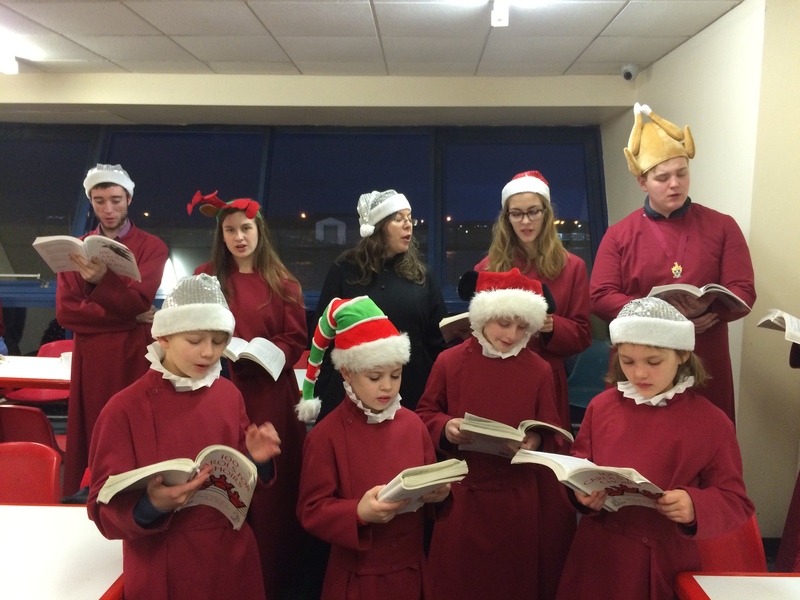 Somewhere in between all of the singing at the Minster, there was also time to sing at Grimsby Fish Market at some unearthly hour of the morning on the day after the Civic Carol Service, as well as to enjoy some relaxation together on the Choir Treat day and at the Chorister party. 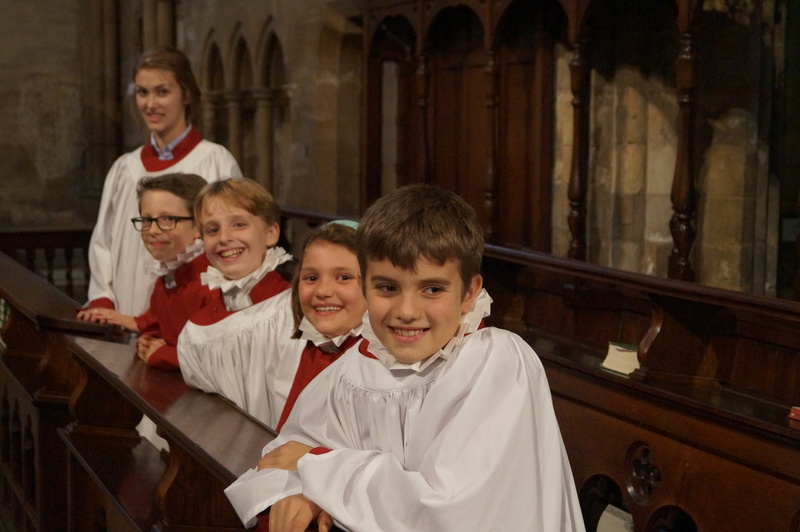 A huge thank you to all of our singers, as well as to parents and everyone else who works so hard behind the scenes to enable everything that goes on at the Minster. We hope that you enjoy the remainder of Christmas, and look forward to the first choral service of 2015: Choral Evensong for Epiphany on Sunday, 4 January at 6.00pm! 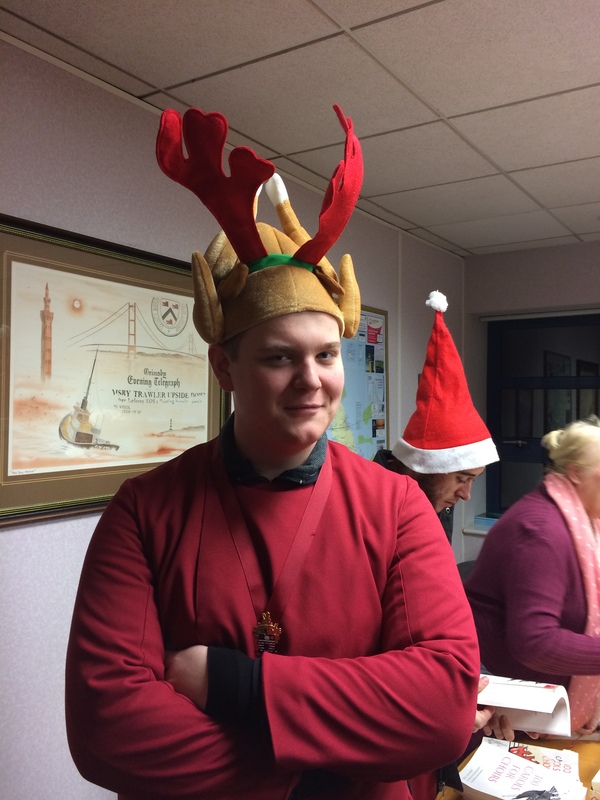 A few photographs of the run-up to Christmas are attached, below, for your enjoyment! 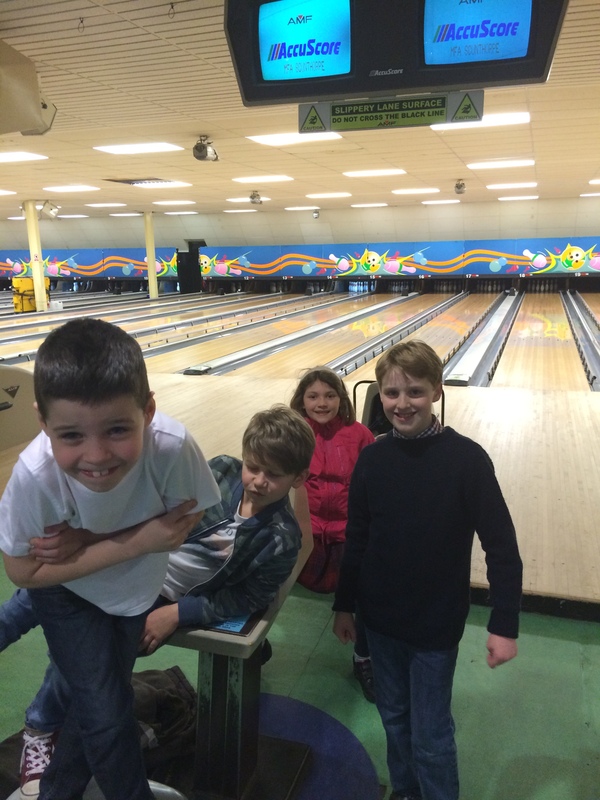 Some of the Choristers, pictured at the end of bowling whilst on the Choir Treat day. 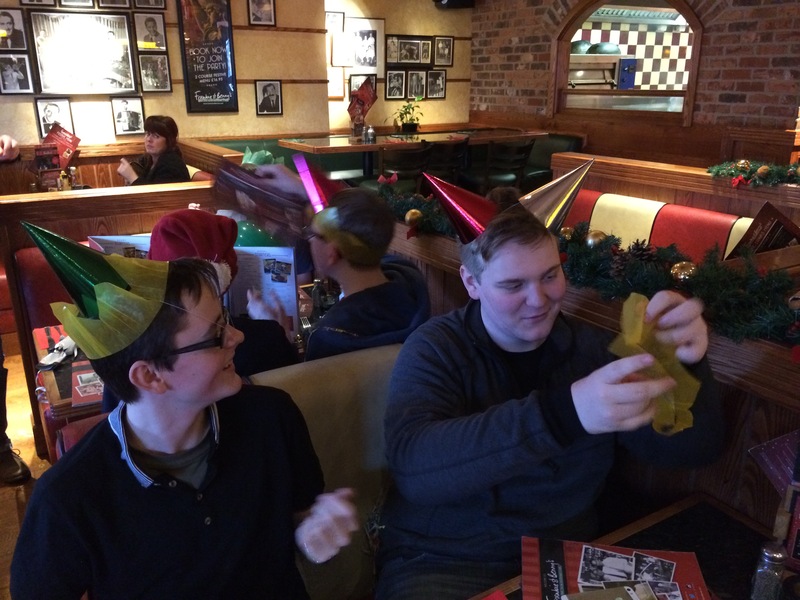 One hat is not always enough, as the Choral Scholars discovered at Frankie and Benny’s, whilst on the Choir Treat. 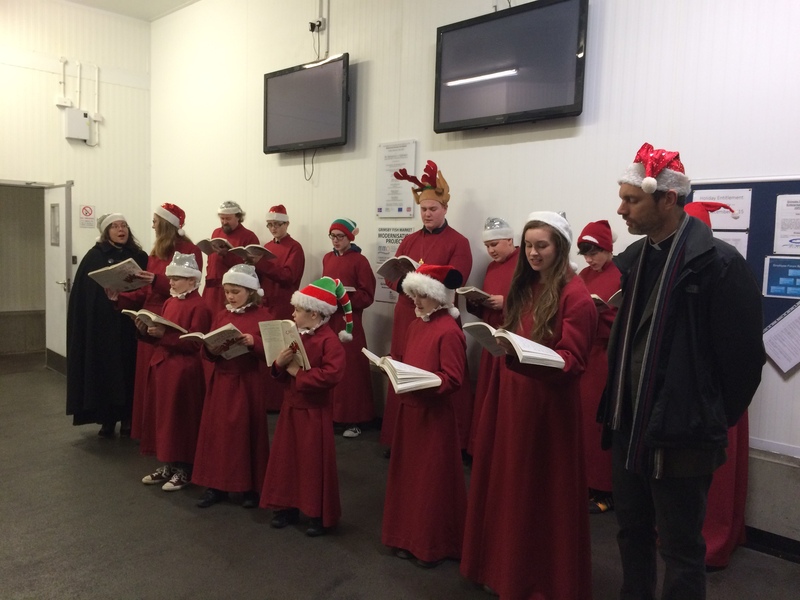 The Choristers singing “Away in a manger” with the other children present at the Crib Service on Christmas Eve. 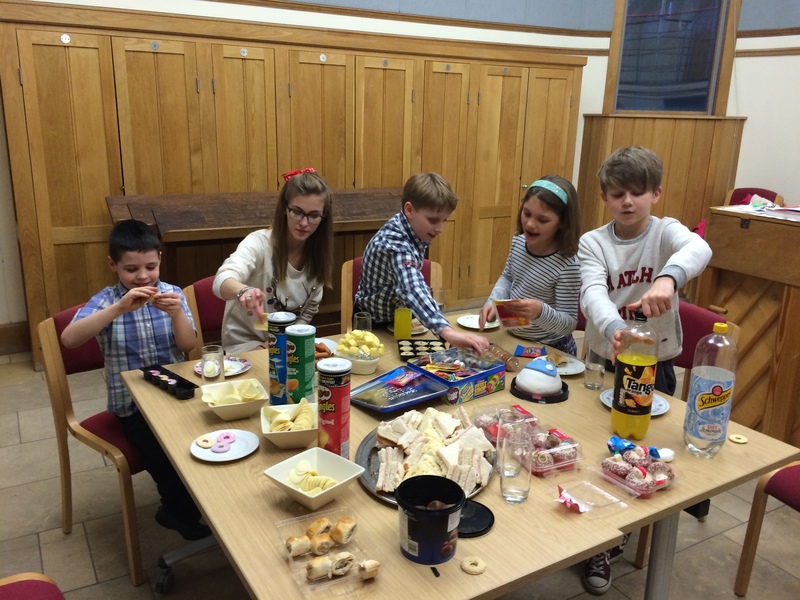 A mountain of food at the Choristers’ Christmas Party. 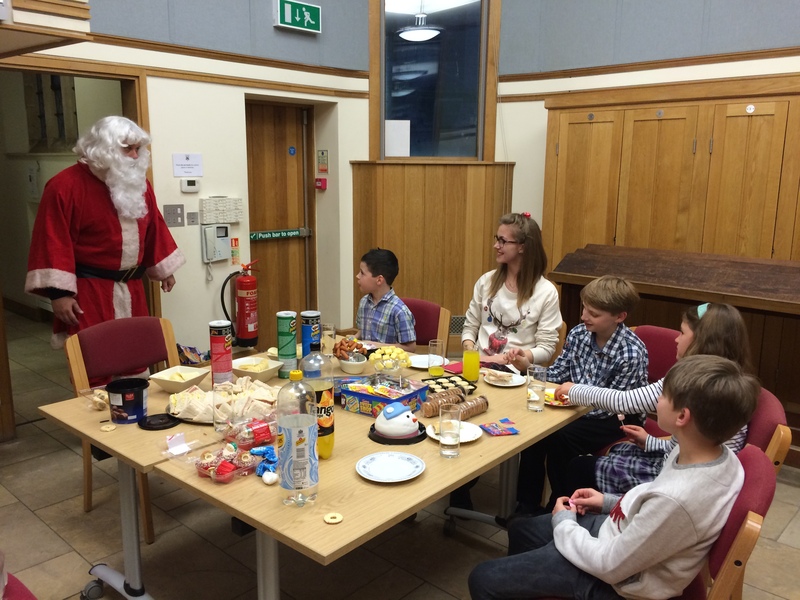 A special visitor interrupted his Christmas Eve to call into the Choristers’ Party. Midnight Mass, including a spirited rendition of Schubert’s Mass in G.
“Born that Happy Morning”: Christmas day at the Minster. Happy Christmas: on holiday with a box of chocolates to prevent starvation! 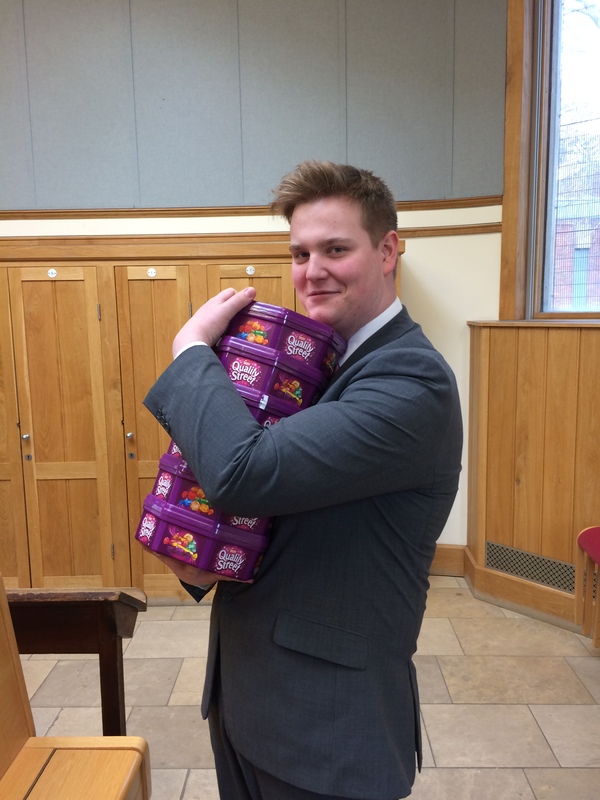 Senior Choral Scholar, David Whitworth, attempts a getaway with rather more than his allotted number of chocolates! 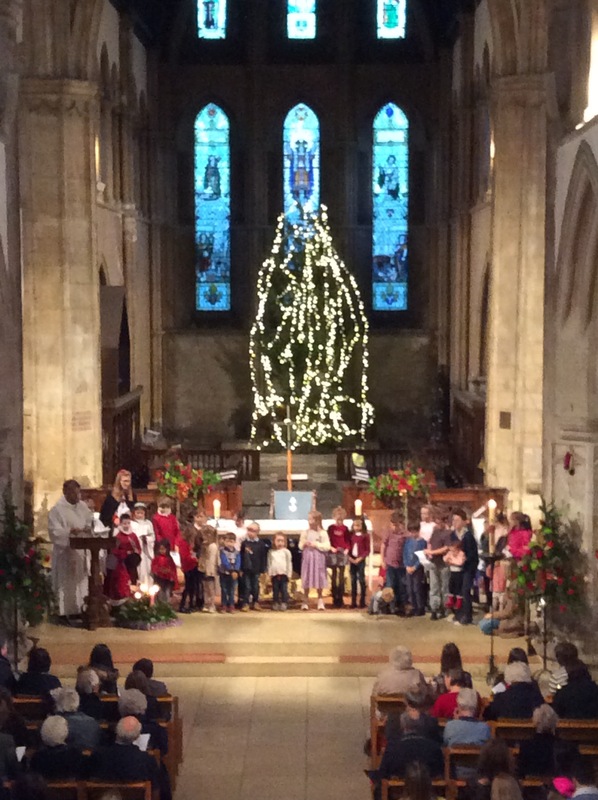 After a very busy Advent season with very many carol services, eucharists, evensongs, and various other events sung by one, more, or all of our Choirs, we are nearly at Christmas. At the time of writing, we have only three services to go before the Choirs have a well-earned Christmas break. 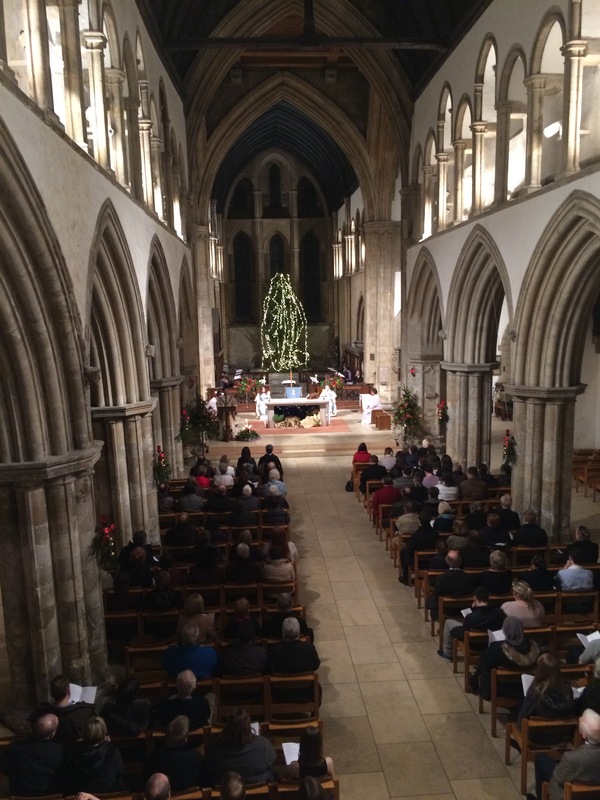 We look forward to welcoming you to the Family Crib Service on Christmas Eve at 3.00pm, or to the Minster’s first Midnight Mass in very many years, Christmas Eve at 11.00pm. 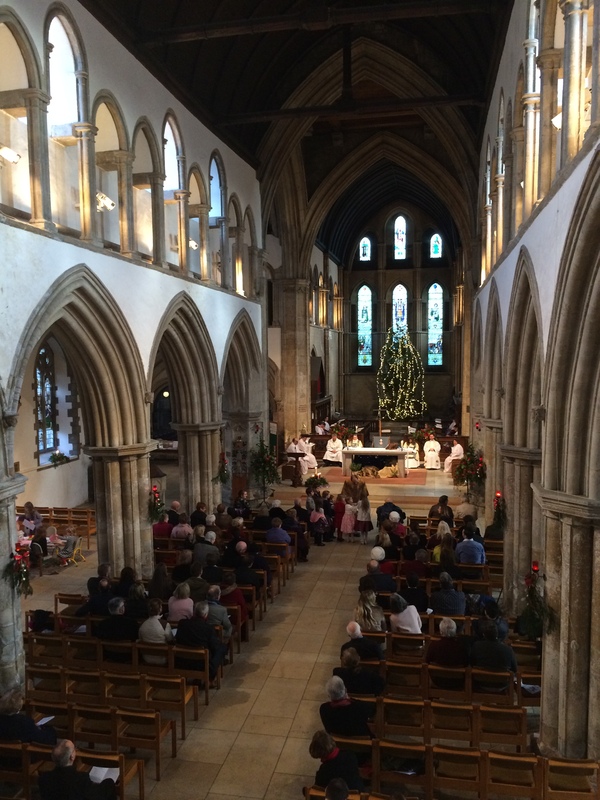 The final choral service of the year will be the Festival Eucharist on Christmas Day itself at 10.00am! 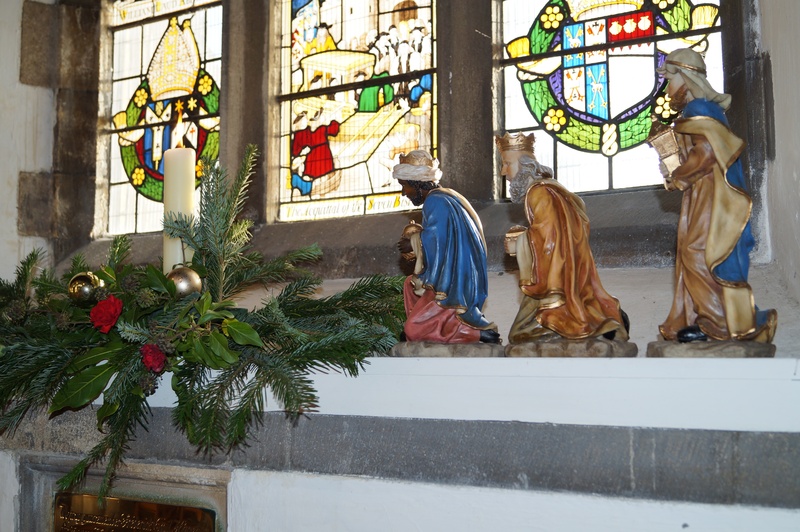 We celebrate the start of the Church’s year on Advent Sunday, 30 November. Our musicians will be in action on three times at the Minster. The morning sees the Choristers and Choral Scholars singing at the Sung Eucharist at 10.30am. Votive candles in the Lady Chapel at the Minster. In the afternoon, a quartet of singers from our choirs sing at the St Andrew’s Hospice service, 30 November also being St Andrew’s Day. 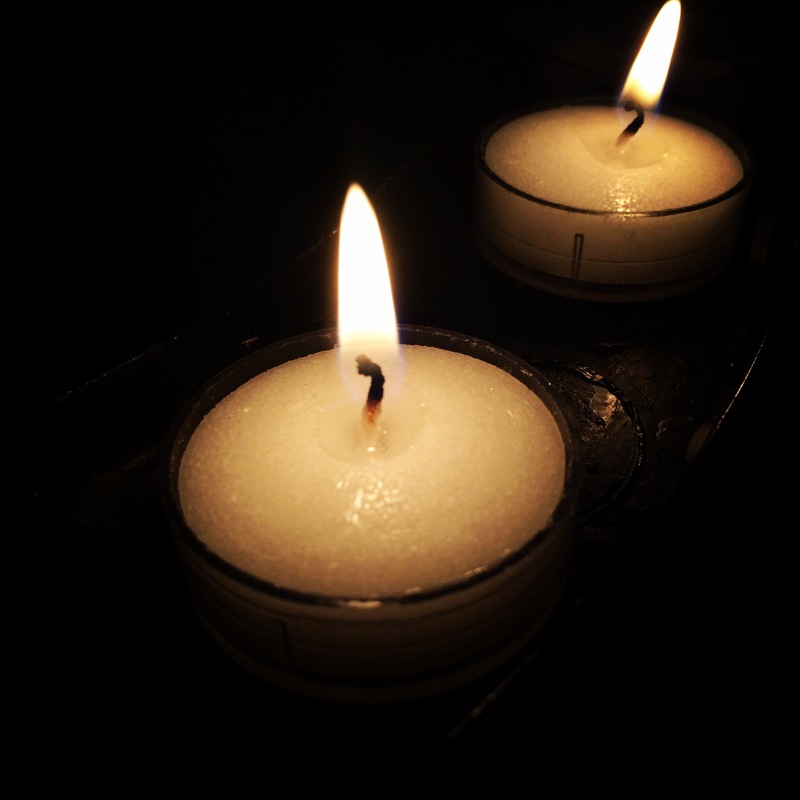 The culmination of the day is the beautiful candlelit Advent Carol Service, sung by the Minster Singers, at 6.00pm. Including music by Palestrina, Joubert, Robert Walker, and others, this is a wonderful, reflective way to start the season of Advent, as we look forward to Christmas.